The performance poverty line is the plateau at which your website’s load time ceases to matter because you’ve hit close to rock bottom in terms of business metrics. 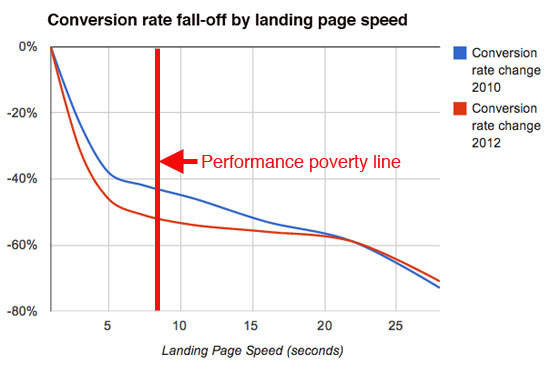 If your pages are well below the performance poverty line, making them a couple of seconds faster doesn’t help your business. Here’s how to find the poverty line for your site. Having an ambitious performance goal, such as delivering pages in 2 seconds or less, is an essential part of your web strategy. But in conjunction with that goal, you also need to know at what point your site bottoms out in terms of delivering conversions, page views, revenue, stickiness, or whatever metrics are key for your business. The performance poverty line for these sites was around 7-8 seconds across all three metrics. What’s noteworthy here isn’t just this number, but how incredibly consistent it is across all metrics. When pages are slow, business metrics suffer more now than they did two years ago. For example, look at the final graph. A page that took 6 seconds to load in 2010 suffered a -40% conversion hit. Today, a 6-second page takes a -50% hit. Or look at the second graph, where you see that a relatively fast 4-second page suffers a -30% hit in page views per visit in 2010, but in 2012 a 4-second page takes more than a -40% hit. This indicates a substantial change in consumer expectations. Simply put, people are less willing than ever to suffer slow pages. 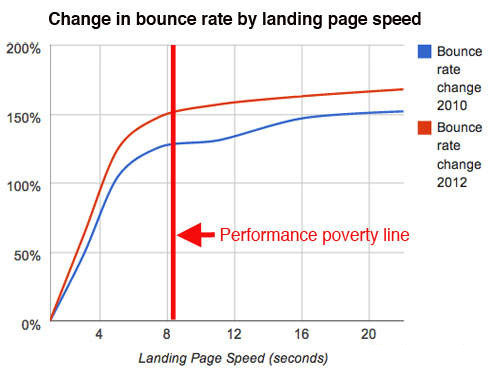 Your results may vary: 7 seconds may not be the poverty line for your site. Fortunately, the process for identifying the low end of your site’s performance threshold is fairly straightforward. All you need is access to a statistically significant amount of your web data, plus whatever analytics tool you use for tracking key metrics. Step 1: Identify the metrics you want to measure. If you run an ecommerce site, then you’ll obviously want to measure revenue. If you’re a SaaS, then you may focus on conversions. If you’re a media site, then page views and bounce rate matter. To ensure that you get statistically relevant results, the more data you can gather, the better. When we conducted our tests, we aggregated millions of transactions that took place over a single month. We found that using the x axis for load time and the y axis for the metric yielded easily readable graphs. Step 4 (optional): Compare to previous time frames. If you want to find out if your customers’ load time expectations have changed over time, as we found in our test, repeat steps 1 through 3 for an earlier time period. Depending on how far back your data goes, it would be extremely interesting to track changes year over year. Step 5: Share your findings. Evangelize your results within your organization. Knowing how low your bar can go is, in its own way, as critical as knowing how high you want it to be. And incidentally, as you may have already noted when looking at the graphs above, this process will also give you valuable insight into how your metrics are affected at other points on your graphs. I’m very curious to find out if our 7-second poverty line is consistent across other sites, or if it varies. If you go through this exercise, I’d love to hear your results. What exactly is being shown in the graphs? – Are your lines connecting data points or best fit? – How many points are used in the aggregations? – What’s the size of the aggregation buckets? Did you decide to pump window.performance metrics into your analytic solution to get the average page load time? Im trying to understand how you determine the page load time for those millions of transactions. Pingback: SEO 101: How Important is Site Speed in 2014? What’s up Dear, are you truly visiting this website regularly, if so after that you will absolutely obtain pleasant know-how. How you guys figured this out is beyond me. Very interesting take. I had to re-read 4 times before I grasped it. very good. thanks! 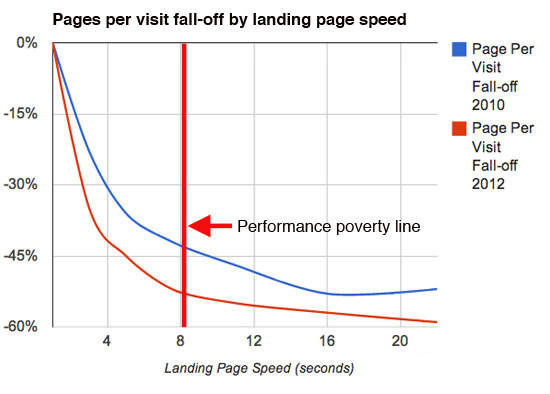 Great information on page performance poverty line.